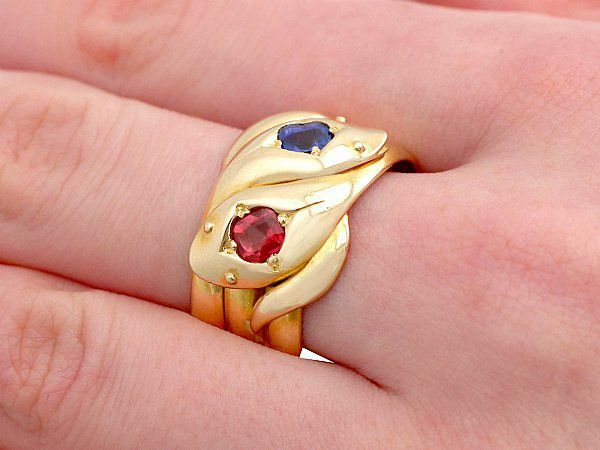 This exceptional vintage ring has been crafted in 18 ct yellow gold. The ring has a substantial, multi-strand form, modelled in the shape of two intertwined snakes*. 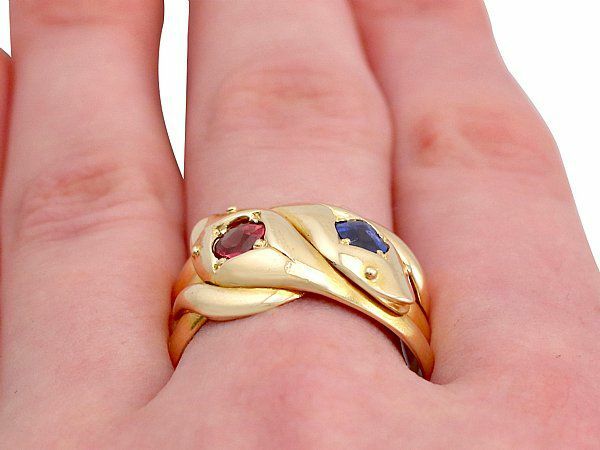 The serpents' heads of this vintage gold snake ring are independently ornamented with a paste** ruby and sapphire in addition to small applied bead eyes. The multi strand shank form integrates in to the design, forming both the head and tail of each snake. This versatile ring, which may be worn either by ladies or gents, is clearly hallmarked to the interior with the gold guarantee mark (crown), the 18 ct gold fineness mark (18), the London Assay Office hallmark (leopard's head) and the date letter for 1945 (K). 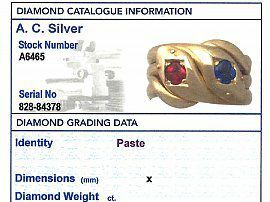 This impressive vintage gold snake ring is supplied with an independent diamond grading report card. NOTES* Snakes were a universally popular expression of eternal love or a powerful symbol of wisdom. 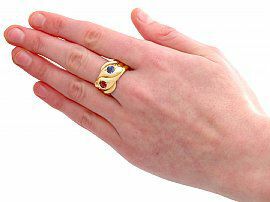 **Paste 'gemstones' were a part of evening jewellery sets. Such crystals, which were made of high-lead-content glass and had a permanent foil backing, were used to give the illusion of almost any gemstone, such as diamonds, rubies, sapphires, emeralds and amethysts. This vintage 1940's ring is an exceptional gauge of gold and fine quality. The hallmarks to the interior of the shank are deeply struck due to the exceptional gauge of gold, and all are very clear. Reflections in photography may detract from the true representation of this fine example of paste jewellery/estate jewelry. Width across snakes' heads 1.78cm/0.70"